Where space gets lateral and residual, Space Station -Tellapur stands inspired by its enviable presence in the heart of new Hyderabad. Surrounded by IT hubs, financial district, world renowned schools and colleges and the outer ring road connecting you in just a few minutes to the newer developments, Space Station -Tellapur is a home for the progressive buyer who lives life with nothing but the best around him. Space Station - Tellapur is well served by road, rail and air, yielding access to the rest of the country and beyond. The Outer Ring Road and 100 feet road has improved accessibility to generate a thriving community that’s always within reach. 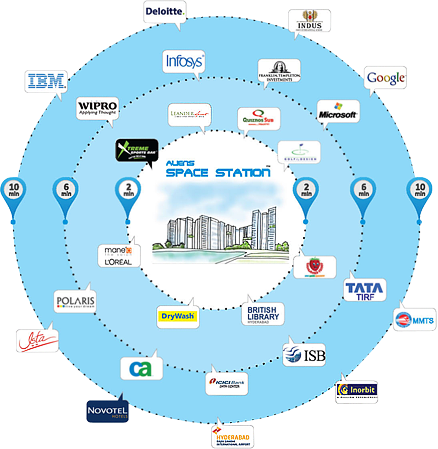 Major MNCs such as Wipro, Infosys, Microsoft and world renowned institutes such as ISB, HCU, IIIT are in close proximity making Space Station the most desirable location for residents and businesses alike. 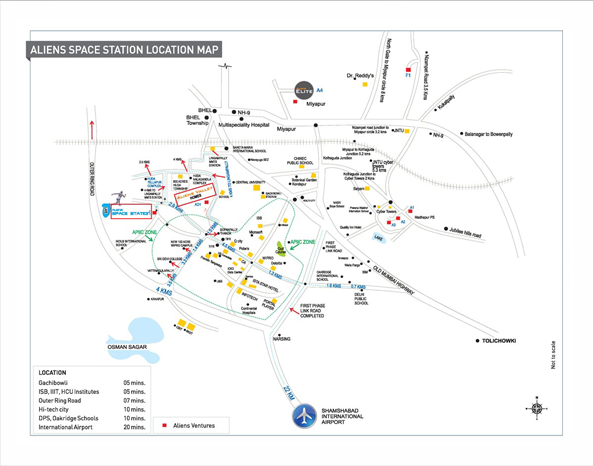 ORR that is just 2 Km away from Space Station will bring in the proximity to all that's new and vibrant in Hyderabad. Aliens Space Station - India's first Pre-certified with a Platinum Rating by Indian Green Building Council (IGBC) in the Residential Townships category. Copyright © 2013 Aliens Group. All rights reserved.